Seeds have the amazing ability to remain viable over long time periods under harsh conditions and to germinate when the environmental conditions become more favourable. This phenomenon of viability retention relies on one hand, on a very specific controlled desiccation of the seed’s contents during its maturation such that the water content is reduced to 10% of the seed’s dry weight. On the other hand, the process of rehydration also plays a key role in the success of germination. If some of the main changes occurring in seeds during dehydration and rehydration have been understood, in particular gene expression and biochemistry, the microstructural changes occurring within seeds during the transfer of humidity remain poorly documented so far and represent a key issue to better understand the acquisition of desiccation tolerance. 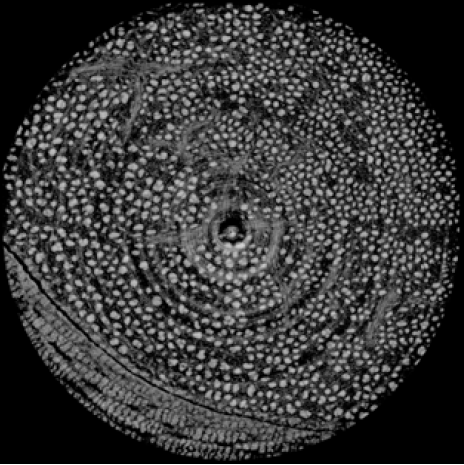 The overall aim of this project is to investigate, using 3D synchrotron tomography, the microstructures of seeds during maturation and germination, in order to establish the relationship between changes in seeds microstructures and their ability to tolerate desiccation and rehydration. The adopted strategy consists of a comparison of seeds being either tolerant or intolerant to dehydration and rehydration. For that purpose, seeds are grown under controlled conditions and analysed at different developmental time points before, during, and after desiccation as well as during rehydration and germination.